Manorbier Castle is definitely well off the beaten track. Located in Pembrokeshire a few miles off the A4139 on the very narrow B4585, it rests in the lovely Welsh countryside described by that famous Welsh renaissance man, Giraldus Cambrensis as "the pleasantest spot in Wales". We must forgive Giraldus (more affectionately known as Gerald of Wales) for any bias on his part; having been born at Manorbier in the 12th century, he openly admitted his partiality for the place. However, his assessment was not frivolous. The drive to the village of Manorbier takes you through some of the most scenic parts of Pembrokeshire, and winds dramatically along leafy hedged lanes towards the coast. In fact, the castle and its surrounding lands are nestled in a narrow valley carved from two streams which flow past sandy beaches to Manorbier Bay. On the opposite ridge-top is the interesting Church of St. James above right), vitally active during the Norman times when the castle was established. And in the valley below, tangible vestiges of castle life complete the picture of feudalism at Manorbier. The castle at Manorbier is an unusual vision, a startling combination of beauty and function, residence and fortification, comfort and utility, which entices, enchants and educates the curious mind. Superficially, the castle may be seen simply as a lavish residence for wealthy Norman landowners but it is so much more than that. While the place certainly exudes warmth and luxury, the castle also represents the harsher realities of life with the Normans and the subjugation of the local Welsh populace. 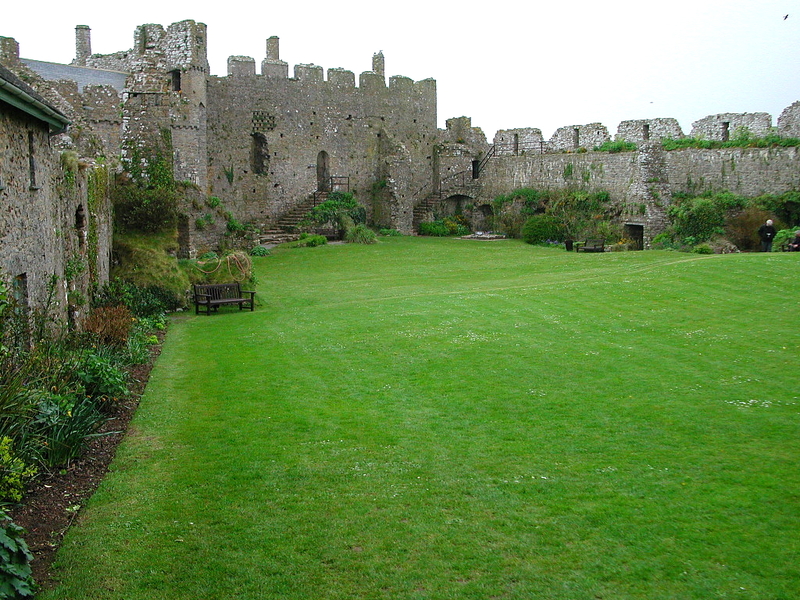 Below: The Inner Ward at Manorbier Castle. Despite the ironic duality of the manor's existence (or perhaps because of it...), we can take tremendous pleasure in exploring what has survived from the Middle Ages. 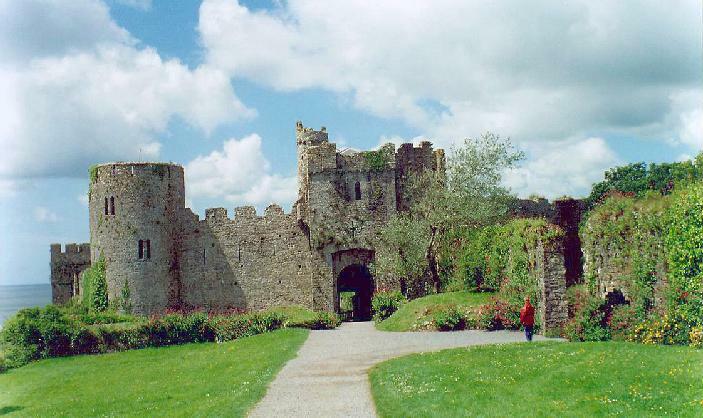 Manorbier Castle sits majestically above the adjacent roadway which leads to the main entrance. Sheltered by trees and shrubbery, the castle suddenly pops out before you when you set foot on the grounds. Ahead is the outer bailey, with its fascinating relics from the English Civil War: the redan, a series of earthen embankments and ditches which were reinforced with stone, and would have impeded the advance of the enemy. On your left, the rectangular great gatehouse is a lovely spectacle. Rather simple in design, it projects over the surrounding ditch and beckons entry. Like many gatehouses, this one at Manorbier contains several defensive features: strong battlements, a portcullis, arrow-slits and machicolations (openings over the passageway through which liquids or solid missiles were thrown down upon attackers). Its simplicity indicates a lack of fear on the part of the castle's owners, but the defenses imply recognition of the potential for outside attack. The fine gatehouse leads directly to the inner ward, and an immediate and exhilarating experience. The inner ward is pleasingly attractive, with its brilliantly colored flowers and bright green lawn encompassed by well preserved brown stone. The castle's basic plan is almost rectangular, and consists of a sturdy battlemented curtain wall with niches and powerful corner towers (one of which is round and offers a breathtaking vista of Gerald's favorite landscape), a complex hall-range, and a huge barn. Undoubtedly the most intriguing features of the inner ward are the massive industrial hearths on the west and southern walls, notable for their novel Flemish chimneys. They create an atmosphere of domesticity even though their purpose was probably the forging of metals. 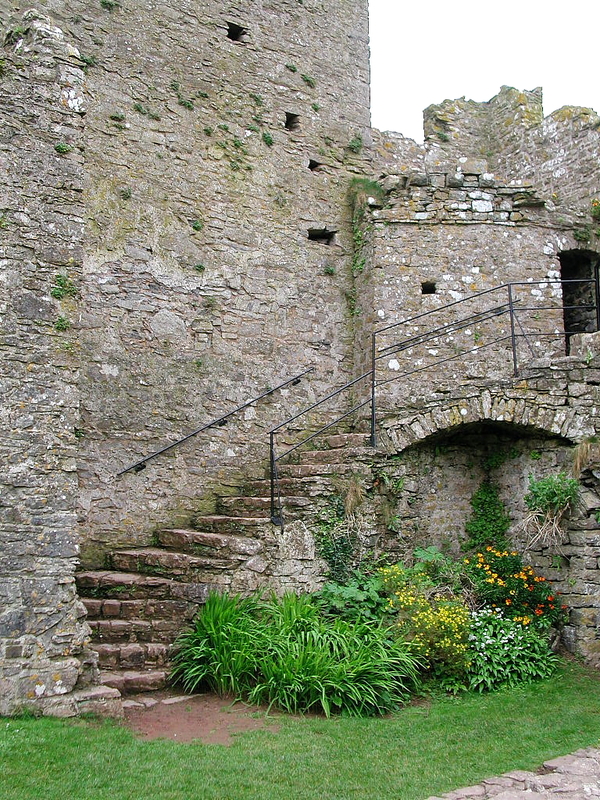 The main domestic wing at Manorbier Castle was the hall-block, built in the 12th century by William de Barri, Gerald's father. Unlike many Norman strongholds in Wales, the de Barri's castle contained a hall-keep, built as an integral part of the curtain wall rather than as a free-standing structure. Whereas most keeps are generally defined as self sufficient, independent, multi-storied buildings which functioned both as a lord's residence and a military stronghold during a siege, the hall-keep at Manorbier was more an area of routine living. Located along the southwestern wall, across the inner ward from the great gatehouse, the hub of this complex of buildings was the impressive great hall. The buttery and pantry (service buildings from where the evening meals were served) were strategically constructed adjacent to the hall, along with the kitchens and ovens, so that the meals could be served while still hot! Above the buttery are the remains of the old solar, the original withdrawing room of William de Barri's fortified home, and the most likely place for Gerald's birth. Although the upper floor no longer exists, an elaborate fireplace with lampstands, windows with seats, and an outside latrine indicate that comfort was indeed a major consideration. Thus, the chamber would have been an appropriate site to ease the travails of medieval childbirth! Erected in the 1140's, the great hall is very possibly "the earliest stone building surviving at any castle in west Wales (Davis, 1992)". A huge fireplace juts out into the main section of the room, with elegant carvings, a massive cylindrical chimney, lampstands, and an oven in the rear wall. Windows with seats also adorn the hall, and the upper floors would have supported the lord's private apartments. The hall's battlements and unusually thick walls gave the revellers inside extra protection in time of attack, and made this the most likely place of retreat when an invasion was imminent. One very curious feature of the hall is the presence of a dovecote, not visible from the interior walling but facing into the inner ward. These roosting holes may have provided homes for the winter food supply, but more likely housed homing pigeons. On the southern side of the great hall are the chapel, the spur tower (a tall building holding latrines which emptied outside the castle walls), and the watergate (built to allow access to and from the waters of the bay, which once splashed the castle's base). Certainly, these buildings showcased the status of the de Barris and later owners of Manorbier. Entered from the inner ward via a grand staircase (still accessible), the well preserved and wonderfully ornate chapel sits at an angle to the south of the hall. Erected in about 1260, this was a truly magnificent building in its heyday, and even today we can appreciate its former grandeur. Originally, the structure was roofed with elaborate vaulting and plaster-work, the floors covered with tiles, and rooms lit with several large windows. 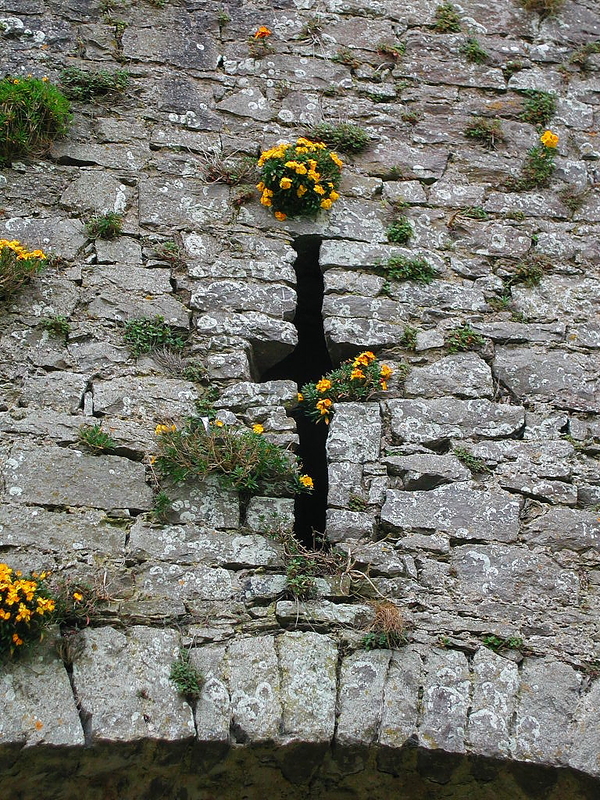 The piscina and sedile (used by the priest during a service) still remain, carved deeply into the walls. Remarkably, patches of medieval wall-painting have survived, faded by time but providing us with a surprising glimpse at medieval artistry. The entire hall-block was underlain with vaulted basements. At the southernmost end was the sub-chapel, unexpectedly ornate for a ground floor chamber. 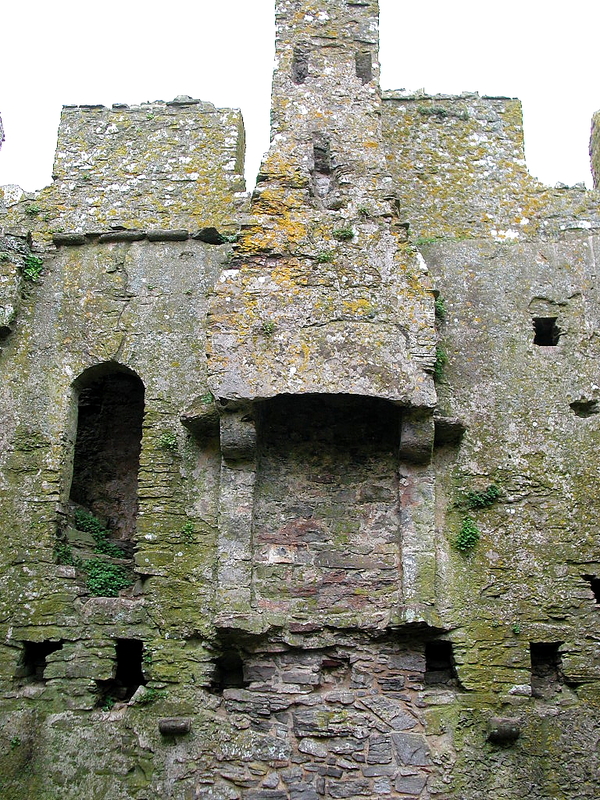 Its most notable feature is the interesting Elizabethan fireplace, with its huge twin chimneys and a small oven. Like the hearths in the inner ward, this fireplace was most likely used for industrial purposes; however, the sub-chapel may have served as an auxiliary kitchen or warmed the chambers above. The southern section of the castle, on your left as you enter the inner ward, has been greatly renovated over the years. Now used primarily as the caretaker's lodgings, the "modern" house was built in the late 19th century by Mr. J.R. Cobb, a fascinating character who played an integral part in the castle's revitalization. Alongside the house are the fine remains of a great barn, marked with air-holes to aid the respiration of livestock penned inside. J.R. Cobb, an antiquarian and castle lover who was largely responsible for the restoration of many Welsh castles (particularly in Pembrokeshire), leased the de Barri's fortified manor in 1880. His legacy may be noted in the restored floors of the towers and the gatehouse, new windows and repaired stonework, as well as the house. Other features added to the castle in the early 20th century include "mean little stoves and fireplaces ... intended for the comfort of soldiers during the 1914-18 War (King & Perks)" and a lawn tennis court. While the "little stoves" can still be seen today, the tennis court has fortuitously been replaced with the lush green carpet of the inner ward. 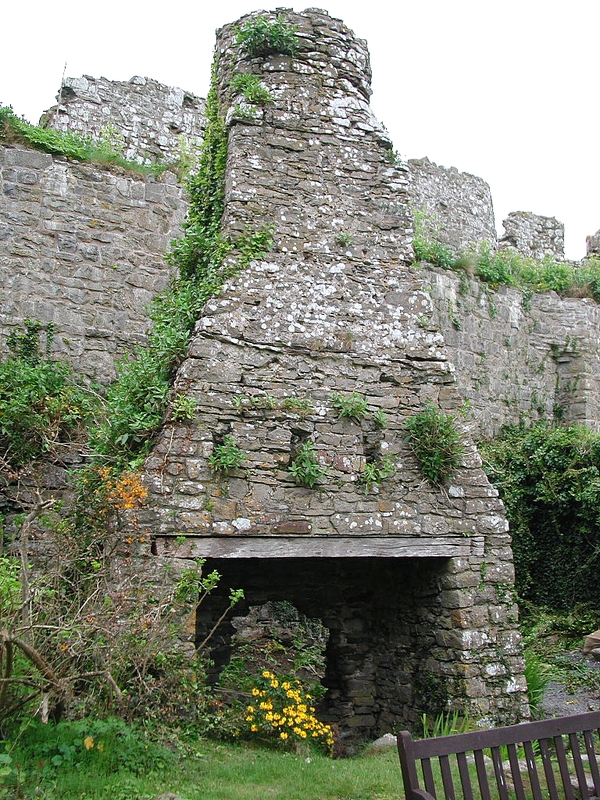 While much of Manorbier Castle's superb state of preservation can be attributed to the efforts of J.R. Cobb, its fairly uneventful history also ensured its safekeeping. Unlike many Welsh strongholds, Manorbier remained relatively unscathed during its lengthy lifetime. 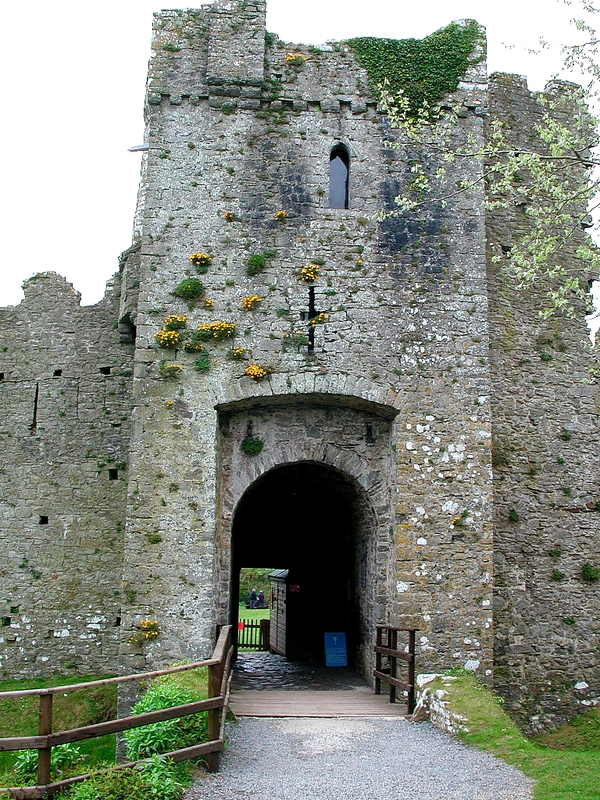 In fact, the fortified manor house saw only two fairly minor assaults: the first, in 1327, when Richard de Barri stormed Manorbier to claim what was rightfully his, and, then, in 1645 during the English Civil War, when the castle was seized and slighted by Cromwell's Roundheads. As indicated earlier, Manorbier Castle's main claim to fame is as the birthplace of Gerald of Wales, son of William de Barri, a Norman lord, and Angharad, daughter of the Norman, Gerald de Windsor (who had a castle at nearby Carew), and the notorious Welsh princess, Nest. 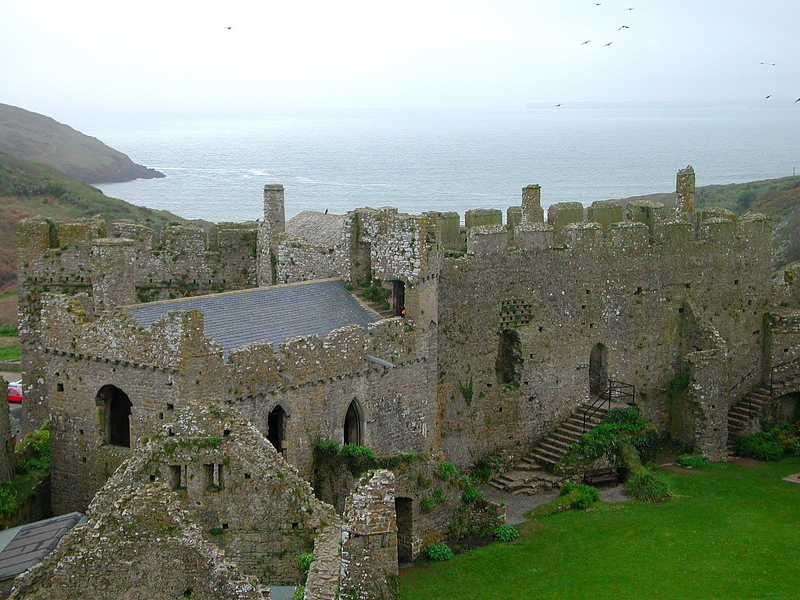 William's father, Odo de Barri, was granted the immense estate at Manorbier (which included the manors of Jameston and Manorbier Newton), as well as the manors of Begelly and Penally, all rewards for his loyal service during the Norman Conquest. It was Odo who built the first castle at Manorbier, an earth and timber fortification which William refortified in stone during the following century. 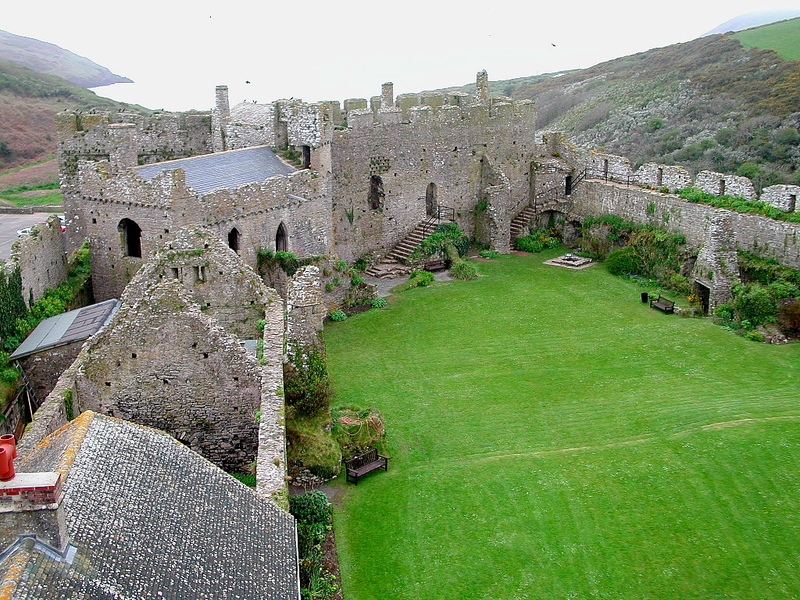 The de Barris maintained control of Manorbier Castle until 1359, after which time ownership changed hands on several occasions, the estates becoming property of the monarchy in the late 15th century. By 1630 Queen Elizabeth sold the castle (then considered "ruynous ... quite decayed (Davis, 1987)") to the Bowen family of Trefloyne. Apparently, the Bowens kept the castle in sufficiently solid condition to be of some value during the Civil War; however, after Cromwell's intervention, the castle was neglected and left to decay. The Bowens passed it to the Philippses of Picton Castle in 1670 for the huge sum of L6,000. A farm was supported on the estate until the Philippses leased the site to J.R. Cobb in the late 19th century. 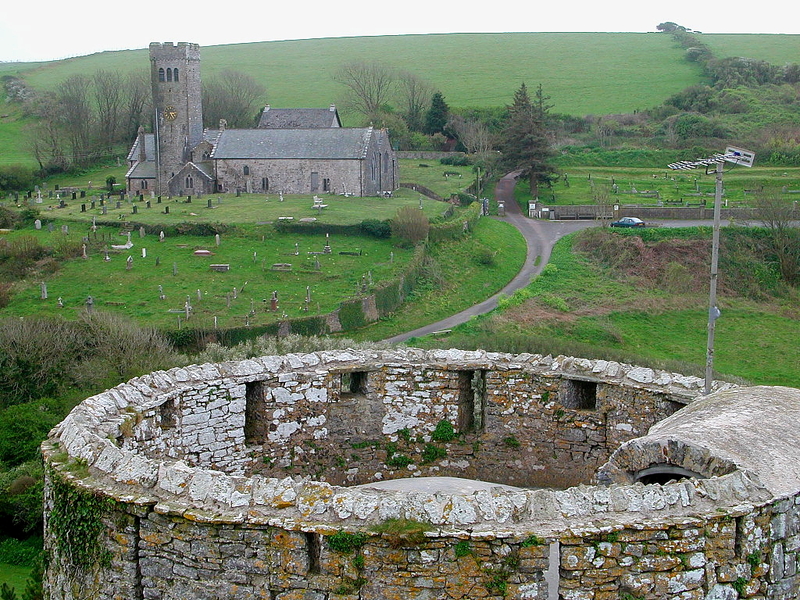 The historic site at Manorbier is unique, for it gives us an all-encompassing impression of feudal life during the Middle Ages, with the castle (the hub of activity), the church on the opposite hillside, and the extensive agricultural lands merging with the sea below. Once comprised of orchards, food crops, and the deer park, the lands beneath the manor today consist mainly of bracken and marshes. Yet, despite the impact of time and neglect, it is possible to gain an accurate impression of how the feudal estate appeared. Wandering a little beyond the farming lands, you will encounter the remains of the castle's mill and pond, the fishpond, and the dovecote (which housed the castle's winter meat supply and is in outstanding condition). Taken as a composite, the medieval relics at Manorbier transport you back in time, to an age when life was simpler but much harsher, yet in many ways more dramatic. 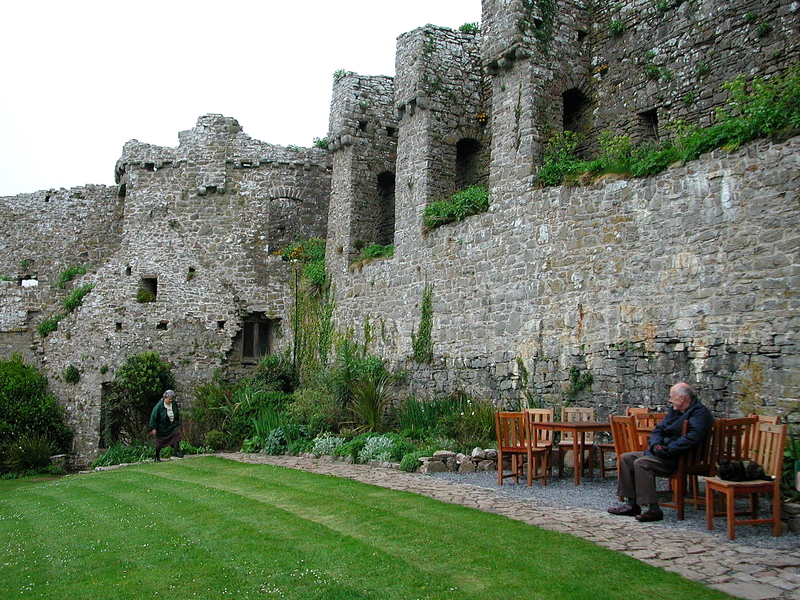 Manorbier Castle is now privately owned by Lady Dunsany (a Philipps descendant) and is open to the public, standard hours. A fine gift shop is located on the site, inside the renovated guardroom adjacent to the great gatehouse. Manorbier is a wonderful place to get away from the stresses of our modern world, to gain an appreciation of life in the Middle Ages as well as the spiritual beauty of the region. Indeed, there is much to do at Manorbier, for the Pembrokeshire Coast Path crosses its shores and hillsides, and is well worth exploration. It even takes you past a Neolithic burial chamber, not too far from the Norman church, and intimately guides you through Gerald's most pleasant part of Wales! [the castle has] "excellently well defended turrets and bulwarks, and is situated on the summit of a hill extending on the western side towards the seaport, having on the northern and	southern sides a fine fish-pond under its walls, as conspicuous for its grand appearance, as for the depth of its waters, and a beautiful orchard on the same side, enclosed on one part by a vineyard, and on the other by a wood, remarkable for the projection of its rocks, and the height of its hazel trees. On the right hand of the promontory, between the castle and the church, near the site of a very large lake and mill, a rivulet of never-failing water flows through a valley, rendered sandy by the violence of the winds. Towards the west, the Severn sea, bending its course to Ireland, enters a hollow bay at some distance from the castle; and the southern rocks, extended a little further north, would render it a most excellent harbour for shipping... This country is well supplied with corn, sea-fish, and imported wines; and what is preferable to every other advantage, from its vicinity to Ireland, it is tempered by a salubrious air..."